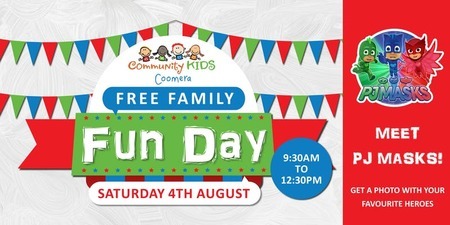 On Saturday the 4th of August 2018, Community Kids Coomera Early Education Centre will be hosting a free family fun day. The event will run from 9:30am-12:30pm, and will include a range of free activities including face painting, animal show, balloon twisting, jumping castle, sausage sizzle, plus the opportunity to have a photo with the characters from popular kids show, PJ Masks. The event is free, however, bookings are essential and can be made online.